This striking bed from the Zelie range of children’s bedroom furniture boasts a stylish lacquer coating and simple design that set it apart from traditional children’s furniture. The Zelie bed boasts a clean aesthetic whilst maintaining a charm and appeal perfect for any child’s bedroom. The range also includes a wardrobe and bedside table, making the perfect set up for any wannabe princess. Looking for a bed that will drive the kids wild with excitement? 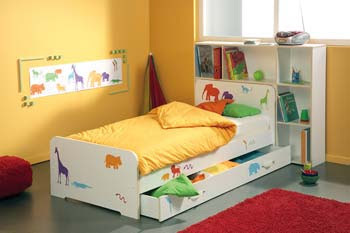 Then choose the Sam Bed, complete with animal stickers to turn any bedroom into a veritable menagerie! The multi-coloured stickers add a playful element to this neutral bed and your choice of which coloured animals to use will mean that this bed will fit effortlessly into any bedroom. The Sam Bed also comes with optional underbed drawers and shelving unit which will make untidy bedrooms a thing of the past! Sugar and spice and all things nice – that’s not just what the Zoe Highsleeper Bed is made of! Below the highsleeper bed is a spacious corner cupboard with hanging rail and shelves as well as coat hooks, bringing you one step closer to every parent’s dream – a tidy bedroom! Add to this a desk which will reduce the pain of the never-ending stream of homework and a mirror guaranteeing a pristine turn out ever day. All of these features are finished in elegant white-stained and pink pine, the stuff of every girl’s dreams!